Grade 1 listed, the Tryst is a part timber framed house of the mid 15th Century which preserves a number of exceptional historic features. It has fine wall paintings which date from the late Elizabethan or Jacobean period. These have been conserved and covered in order to protect them as they are extremely light sensitive and are of national significance. For this reason they are not accessible for general viewing. Its arcaded fireplace, inserted in the 16th century, carved crown post (now visible in the ceiling between the upstairs bedrooms), barge board (front elevation and gable) and gateway are all impressive survivals even in a town that is justly famed for its early buildings. When first built, it formed part of a much larger merchant’s house that included 7 and 8 water street (now The Gardener’s Home and part of Number 10 Wine Bar). According to contemporary documents, the house was likely to have belonged to a wealthy woollen cloth merchant. The dining room was originally a jettied gateway that permitted horses and other traffic to reach the courtyard behind the house. The large brick fireplace was inserted during the first half of the 16th century. On the lintel taper burns can be seen. These were created by rush lights and candles mounted on chains, hooks and low shelves that lit the cooking process. The limestone jambs either side of the fireplace are an expensive feature that probably coincide with availability of stone during the reconstruction of Lavenham church between 1485 and 1525. The niches above are original to the fireplace and would have been used to show off valuables such as pewter or silverware. Around 1600, the hall was decorated with wall paintings in the “Antique” style of the period. 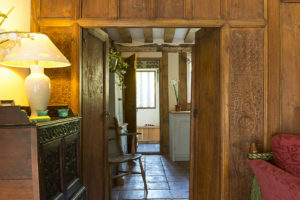 Two arched doorways linked the hall and the parlour which can be seen in the living room and kitchen. It is relatively rare for both arches to survive. The original method of wall construction can be seen in the exposed panel of the second bedroom. This shows the original wattle and daub infill. If you look carefully you can see the remains of a contemporary leather shoe thought, as was typical of the medieval period, to have been placed in the house to ward off evil spirits and bring good fortune. As a grade 1 listed building which is defined as of exceptional interest, sometimes considered to be internationally important. 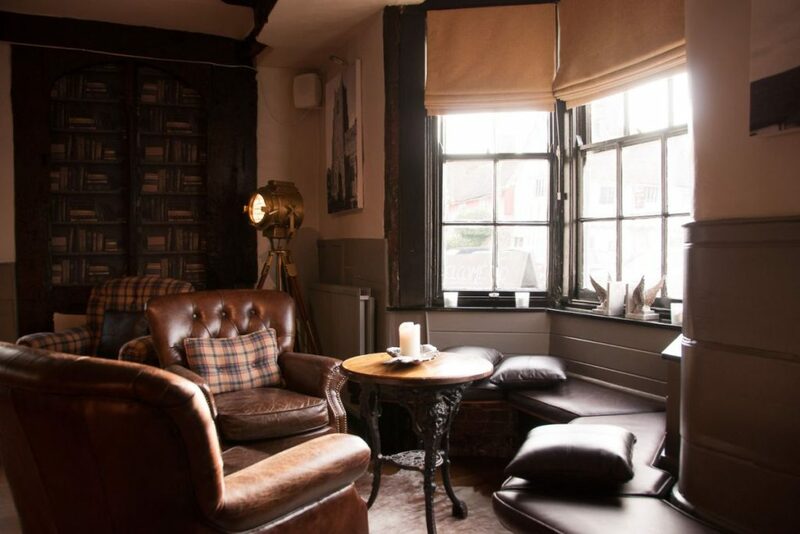 Its Crown post, original barge board, and inglenook fireplace with gothic recesses stir the imagination. Protected behind the carved wood panelling, lie some unique Tudor frescos. 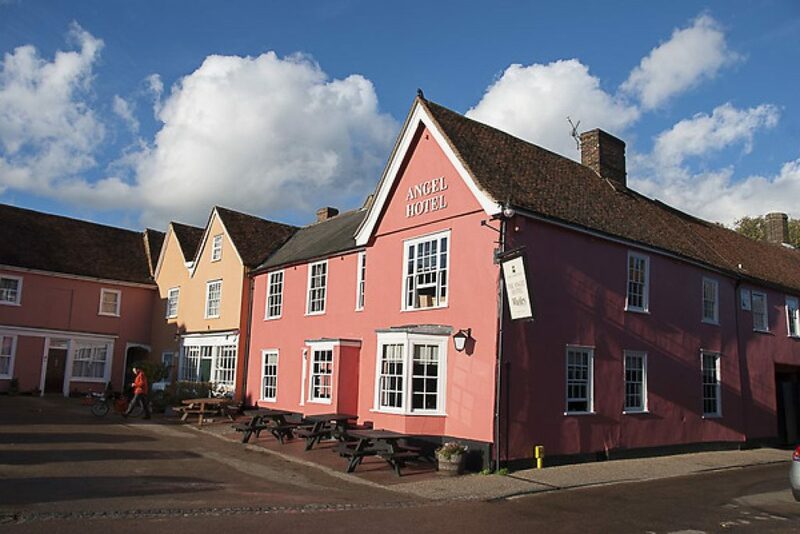 The rapid rise and fall of Lavenham as a prosperous wool town has in many ways contributed to its excellent preservation. Its rise resulted in the ornate and high quality construction that you can see today and its fall and consequential paucity of wealth, allowed few of the houses to be significantly rebuilt to the modern styles of the times. 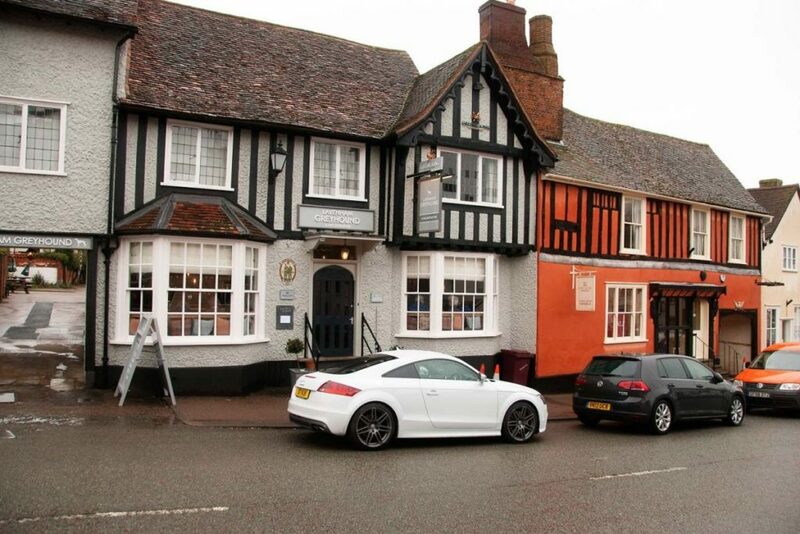 For more detail on Lavenham and its history, you may like to visit the Wikipedia page and Discover Lavenham. We also recommend looking at http://www.thesuffolkguide.co.uk/ as an excellent roundup of what’s on locally. For nearly 600 years and throughout all its transformations, The Tryst has, to the best of our knowledge been a family home.